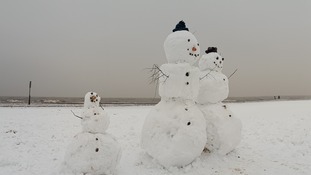 Two families took advantage of the Beast from the East to build snowmen on the beach at Lowestoft. The unusually cold temperatures meant the beach was covered in a thick layer of snow. The creations were the work of the Wrens and the Tuckers. The children are Nathan Wren 8, Aidan Wren 4, Niamh Tucker 9, Naomi Tucker, Daysy Shelley 10 and Sebastian Shelley 5. But the beach snowmen weren't the only amazing creations from across the region. This snow bunny, complete with carrot, was sculpted by Roger Goodchild in Worlingworth. Roger, who's a pest controller, started off trying to make a cat, but along the way it turned into a rabbit. The sculpture took him three hours to make. The animal theme continued in Bedfordshire from where Stuart Knight sent this. The giant Polar Pig was created at Parklands in Bromham. This fine pair of snow people are the work of Liam Segust and Harriet who created them at Gorleston in Norfolk. Meanwhile in Norfolk a snow cat sent in by Jamie, Natalie and Katie from Watton, all very excited by the amount of snow. 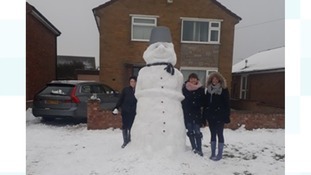 Denise and her mates from Lowestoft sent in this picture of their giant snowman. They said it was so big people were stopping to take pictures as they went past. While Vicki Sturman just wanted to share with us a photo of the igloo her family made in Cranworth in Norfolk. Vicki and her husband made the igloo with their four children Millie, Ellie, Florence and Jack. They say it was getting a lot of attention from passers by and some people even stopped and took photos. Patricia sent this picture of a beautiful castle her son made for his daughters at Taverham in Norfolk. And Rob Setchell from Norfolk decided to celebrate England's latest one day cricket win with this tribute.